Home - Micro Filtrations, Inc.
Let our CETA-certified and NEBB-certified technicians test and certify your clean room. Our consulting helps ensure adherence to sterile compounding pharmacy regulations. Determine the integrity of your HEPA filters. Put our years of experience to work creating a regulatory compliant clean space for your facility. Micro Filtrations, Inc. (MFI) is an international service and consulting firm specializing in environmental contamination control and cleanroom performance testing. MFI opened in 1979. We are experts in testing for certification and compliance, and also provide repair and consulting services throughout a wide variety of industries, including pharmaceutical companies, hospitals, laboratories, medical device manufacturers and aerospace firms. 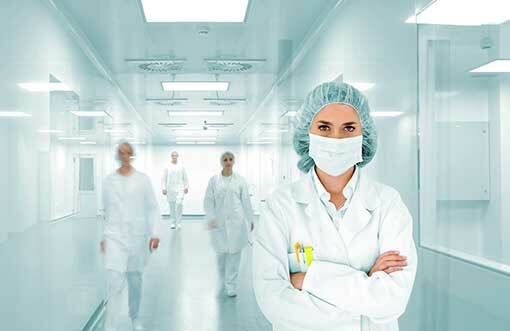 Expert assessment of cleanrooms, biological safety cabinets and HVAC filters. Risk analysis and troubleshooting with our exceptionally qualified team. Environmental sampling that determines the exact nature of your particulate issue. When do I test my cleanroom, BSC, or fume hood? Because of the uniqueness of a client’s situation, the timeline varies. For instance, ISO 14644 requires annual testing, unless you have an ISO 5 space, in which case testing must be performed every 6 months. In the case of USP 797, testing needs to take place every 6 months. How long will the testing process take? In general, testing one biosafety cabinet to NSF specifications typically takes at least an hour and a half. If you have several hoods and want testing of these hoods completed quickly then MFI can provide more technicians. The time required to test your cleanroom varies with the size of the room. If the goal is to complete testing quickly, our team of certified technicians can be larger. If your goal is to have a smaller footprint, then fewer MFI technicians can be on site. How long will it take to get test results back? A preliminary report of your testing results will be provided at the end of the test process. You’ll know if you’re certified and will be notified of any critical or non-critical issues. After quality process review, your final report is typically available within 10 business days. What are MFI's qualifications for testing my cleanroom? Three NSF-certified technicians (out of a total of 6 in the state of Florida) are on the Micro Filtrations team. Two of our lead technicians are triple-certified by NSF, CETA, and NEBB. We believe that the level of expertise you’ll have testing at your facility is the highest available. We serve clients in Florida and the Southeast, but our reach doesn’t end there; Micro Filtrations technicians travel throughout the United States and all over the world for testing, certification, and consulting services. We need your services ASAP. How soon can you be on site? If you have an emergency, we’ll treat it as our emergency. If internal monitoring shows a problem and you need help in the investigation process, or a cleanroom is shut down until an issue is fixed, we strive to provide 24-hour service, even if you’re all the way across the country. Just send us an inquiry and we will get back with you right away!